Our goal is to create solutions that make your product stand out in the crowd. Bring us your issues and talk to our experts about your goals. We have ideas based on years of experience and our unending passion in searching for unique solutions. We can print on leather, canvas, metal mesh, silk, chalkboards, and most other substrates. It’s the huge variety of substrates and how we combine them that sets us apart from other printers. With our different and unique products, we create our clients’ success and help drive consumer response. Not only can we provide wide and grand format printing, but we have a plethora of other marketing capabilities. 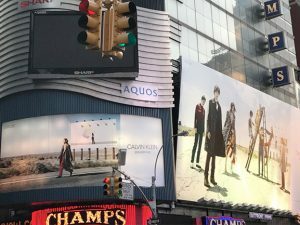 Our wide and grand division works in conjunction with our Retail Visual Merchandising (RVM) department in order to launch full scale retail marketing campaigns. 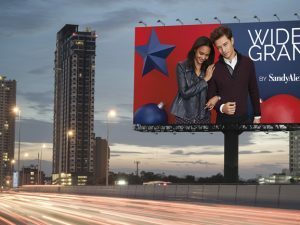 This is able to target a wider, public audience while also providing in-store solutions simultaneously. Combine this with our superior Direct Mail capabilities and massive marketing campaigns can be launched to target consumers. Work Flow and Execution are top priorities at Sandy Alexander. We provide regional, national and global installation with a dedicated in-house installation team combined with our outside network. We are able to maximize speed-to-market using the most advanced and efficient equipment in the industry. Like most of you, we care about the environment. So much so that we actually won an award for the way that we expanded our wide and grand facilities, designing it to be as environmentally friendly as possible from the outset. In order to implement energy reduction, our facility is currently running on 100% wind power and we have been Sustainable Green Printer (SGP) Certified. 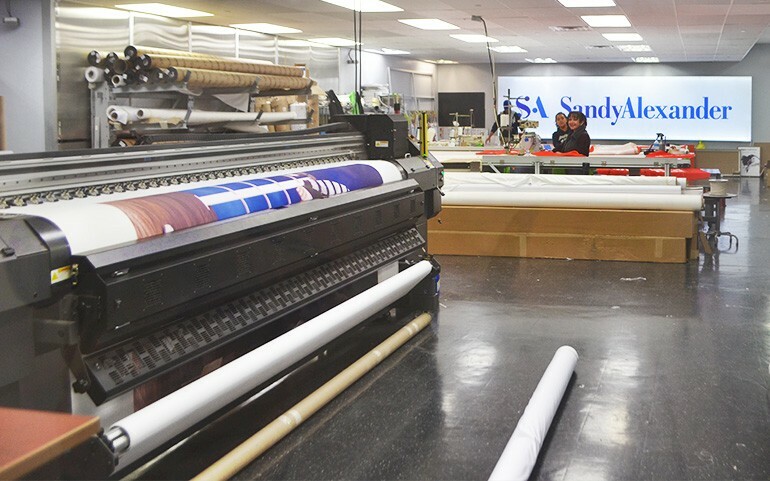 Entering this $10 billion industry in 2010, Sandy has continued to up the game with equipment investments, pushing limits on what Wide Format Printers are capable of. 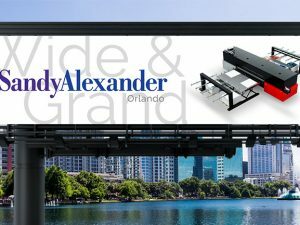 When it comes to Wide Format Printing, Sandy Alexander has solutions that are industry leading and we look to maintain our stance as a leader by utilizing the fastest and highest quality equipment available in the world by continuously upgrading our technology. If you have any questions about Sandy Alexander’s wide and grand format solutions or printing capabilities, contact Gene Palecco at gpalecco@sandyinc.com or call 973 968 3333.